SONAX Wheel Cleaner Full Effect is simply outstanding! Everyone who uses this product can not say enough about how effective it is. It rapidly breaks up just about anything your wheels can come in contact with. It is non corrosive and pH neutral so you can use it on any wheel surface such as chrome, alloy, clear coated, polished, anodized, stainless steel, etc. 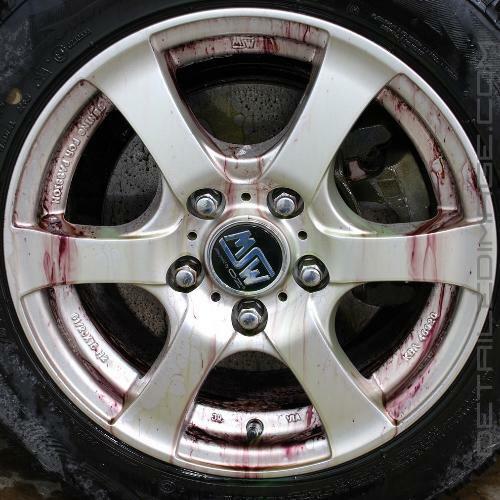 Spray it on your wheels and the formula looks fluorescent green, it quickly breaks down contaminants and changes colors to a deep red. This color change lets you know the formula has broken down, softened and loosened contaminants that can now easily be removed with a stream of water. This truly unique formula provides a deep cleaning that is not like anything you have tried before. Use the SONAX Wheel Cleaner Full Effect and you may never use another product again. 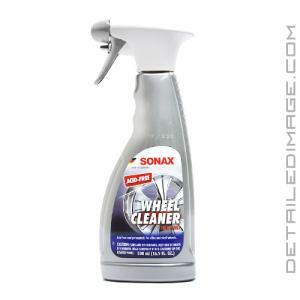 If your detailing needs include heavy wheel cleaning, then I can't recommend the Sonax Wheel Cleaner enough. It's truly a fantastic product! What makes Sonax Full Effect different than other wheel cleaning products is that it is designed to chemically react with the sintered iron particles (brake dust) that are on or embedded into the surface of the wheels. By dissolving these corrosive iron particles, Sonax provides a much cleaner surface than traditional wheel cleaners can do. I get to test more products than you can imagine, and usually I just find relatively small differences from one to the other. Rarely do I find products that provide serious "wow-factor". I have to admit that during these tests, the Sonax Full Effect Wheel Cleaner most definitely provided the wow-factor! For detailers that work on a lot of really bad wheels, I would highly recommend having this product available to cut down on wheel cleaning time. Or for enthusiasts with cars that don't get cleaned that often, this would be a great wheel cleaner to have in your arsenal. Effortlessly removes the most stubborn dirt such as baked-on brake dust, oil and rubber residues from all types of steel and alloy wheels (including chromed and polished wheels). 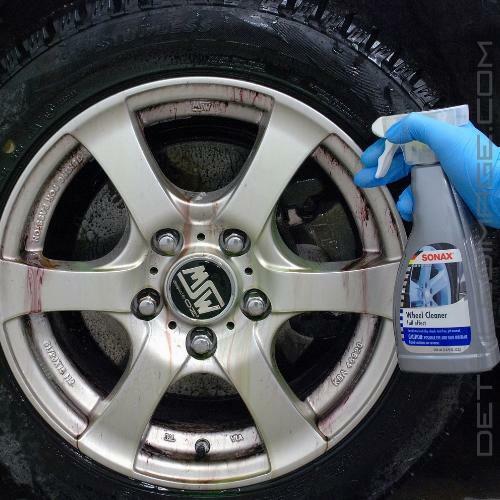 Acid-free so it will not attack wheel coatings, lug nuts or brake systems. With lemon fragrance. DIRECTIONS FOR USE: From a short distance, evenly spray onto all wheel surfaces and let sit for 3 to 5 minutes. The liquid changes its colour to red as it reacts with the iron particles of the brake dust. In case of extremely stubborn soils, use a sponge or a oft brush. Finally, rinse thoroughly using a strong water jet or high-pressure washer. PLEASE NOTE Protect against frost or freezing. Do not apply in direct sunlight or to hot wheels. Do not allow to dry. This wheel cleaner is great. I used it on a fairly dirty painted aluminum wheel that had a good amount of break dust and dirt on it. I let the product sit for 2 minutes and then sprayed off using a low power electric power washer. It removed just about all of the dirt and grime that was on the surface and barrel of the wheel. No damage to any of the surface as well. I will note that I did try this product on a spare painted wheel that I had. I left the wheel in the sun for a few minutes just to see how the cleaner would react on a hot wheel. It did leave some heavy staining that took some time to remove with polish. Would suggest not using this product in the sun and try to make sure the wheels are cool to the touch. 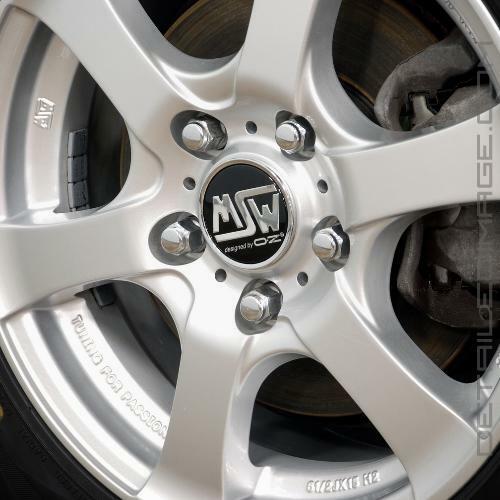 The best product for rims hands down. Cheaper to buy by the gallon with a DI spray bottle. No guess work. Spray on wait to change colors and rinse well. Your done.